The best combination of high tech and human impact was the aim of this innovation concept. A new way of doing bank in a Kitchen living landscape design. We managed with Piraeus Bank a complete program of branch transformation with different formats: spoke, hub and independent. Piraeus Bank is now opening three pilot branches in Athens and one in Salonica. The digital E-branch is one of the spoke concept. Piraeus Bank was the first to launch into the Greek market a new model of a fully automated e-branch “spoke”, designed by DINN!, in three branches within the region of Attiki. Which was our mission? 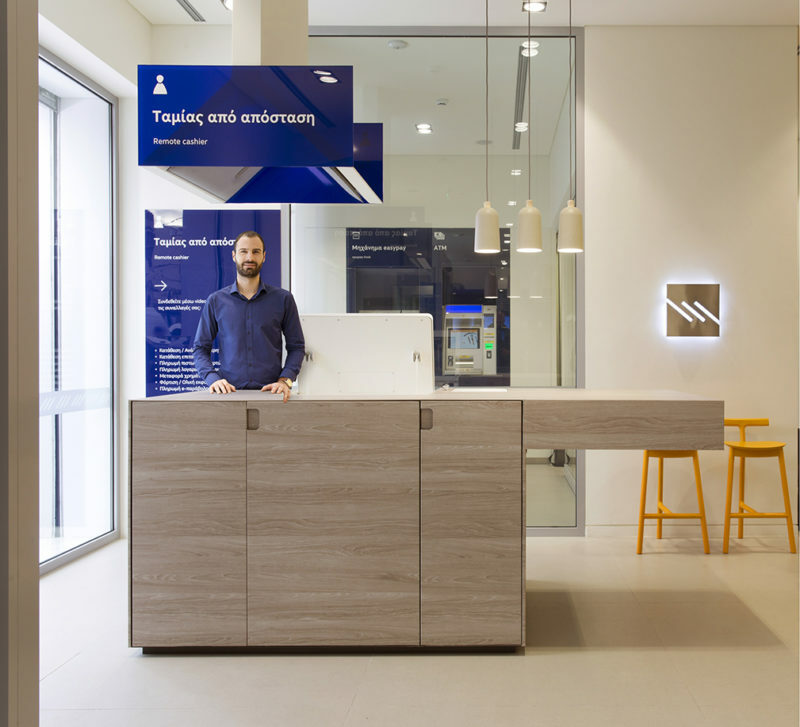 To deliver Piraeus Bank to the top of its real value: we made a fusion between digital innovation and warmth, creating a special case of e-branch where retail and premium customers are delighted and satisfied, even in a self-service way. “E-branch of Piraeus Bank is the first digital branch example in the world that combines high use of technologies and high warmth and simple practice. This is what we call High Touch E-Branch”. Massimo Fabbro, Chairman of DINN! 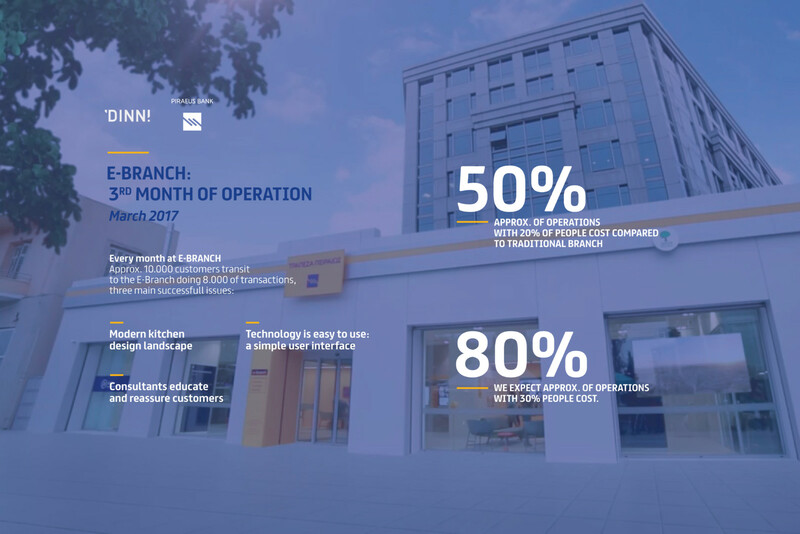 Branch transformation from a traditional bank to a new 3.0 banking operator: the starting point of this high touch Piraeus Bank concept. The idea is to connect “digital and physical” and to change the typical coldness of main digital branches around the world into a new e-branch completely full automated. We designed working on a warm and human approach with a strict interaction between men and machines: the kitchen living was our inspirational view to conceive Piraeus Bank branches. Piraeus Bank and DINN! already won international Prizes thanks to digital E-branch concept: two Awards at Retail Interiors Awards (GOLD Award in Design & Technology and GOLD Award as Best Interior – Non Food Retail) and a Global Banking and Finance Award as “Most Innovative E-Branch Project Greece 2017”. “The awards received recognize and reinforce the direction Piraeus Bank has chosen to take, to innovate leveraging technology, design and new business models for the ultimate benefit of our customers” claims Mr. Stefanos Mytilineos, Deputy General Manager, Retail Banking, Branch Network & Deposits at Piraeus Bank Group. Eftichia Kasselaki, Executive General Manager, Retail Banking, Branch Network & Deposits at Piraeus Bank Group confirms that “Piraeus Bank aimed at creating a unique banking experience offering the best service to its customers and at improving their overall experience through the provision of pioneering services. Our branch transformation project will affect the entire Network of Piraeus Bank (around 700 branches). After the opening of three branches in Athens, we are happy to analyze the success of this digital branch bank concept. The results show the positive effect of the integration of new digital technologies in everyday banking, confirmed by the wide acceptance of new type of store customers even older during their first month of operation. our Pioneering VTM “Remote Cashier” made strike: 35% of total transactions, carried out in e-branch (excluding ATM transactions), were realized by this innovative system. Main business objective for the bank is to boost the digital channel penetration through a new way of training and education for the customers, reducing costs to serve in physical touchpoints and increasing revenues; it means manage the bank with 1-2 key people that perform the role of welcoming, facilitation and education where all activities of a “spoke” retail branch (retail and premium customers) are treated in a completely full automated way. 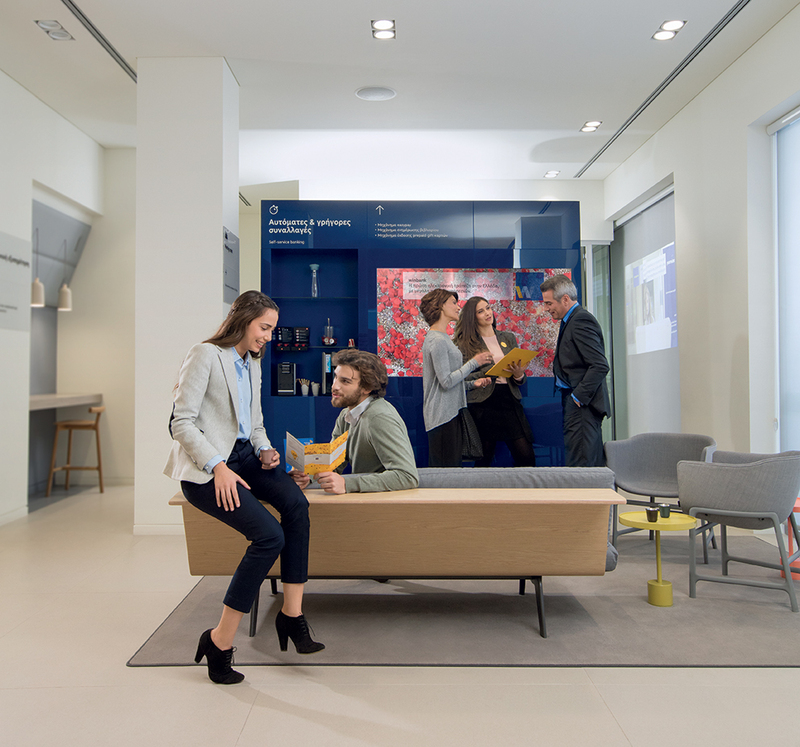 Into new Piraeus Bank E-branches, exactly in the modern kitchen, people have simple and intuitive areas for different operations. Along the walls it is focused all communications and other banking operations. On tables customers can have remote assistance or having meetings with the facilitators. The main piece in technology development is the VTM (Video Teller Machine), entirely designed by DINN! on a Customer Interaction model that facilitates all banking operations and quick consultancy without using cards and special codes. 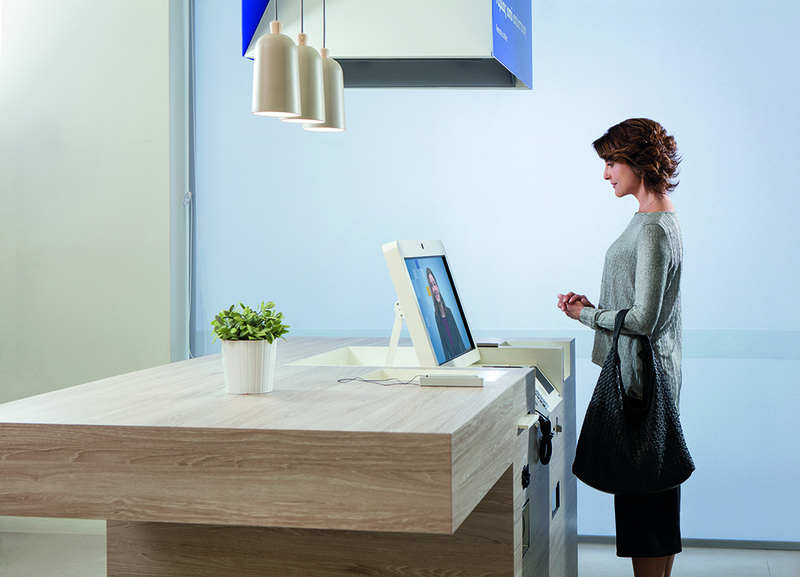 The “Remote cashier” in every e-branch constitutes the greatest innovation in the Greek banking market and one of the greatest at European level. It gives the possibility to Bank customers to carry out over 90% of all transactions of a conventional cashier desk with the assistance of a specially trained cashier through a video call. The transactions that can be carried out are the following: cash withdrawal and deposit, balance update, cheque deposit, money transfer for suppliers’ payment, payment of bills and business debts, payment of corporate cards and loans etc.. Person to person approach became a bridge between the traditional concept of branches and the new digital languages. Since the shop window, you can understand how the space is organized: easy navigation with a total use of friendly approach. A video projector shows the clear and understandable dyed areas and what you can do there in a total self-service way. The new branches operate on weekdays during extended operating hours, as well as on Saturdays, confirming once again the high-quality service and the customer-centered character Piraeus Bank has been showing for many years. Individuals as well as businesses and freelancers have the ability to perform their transactions secure, fast and easy, since no special knowledge or digital skills are required. During all operating hours of the e-branches there will be available facilitators, to whom customers will be able to address for any question, get informed on the services provided, get instructions on the use of machines & digital services of the Bank, as well as assistance in every transaction. On the sofa, customers can relax drinking a coffee or having meetings. For this reason, we designed a concept “kitchen/living” in order to increase warmth and “humanity” of machines. Successful results pushed us to deploy them on the entire network with hub and independent branches. We are designing now these two formats planning a new opening during last 2017 Quarter. Enriching the brand character and experience for retail and SME clients.